When was the last time you took a leisurely stroll through your local grocery store, enjoying a nice cold beer while perusing the aisles? If you live in Colorado, the answer is never. Until now. 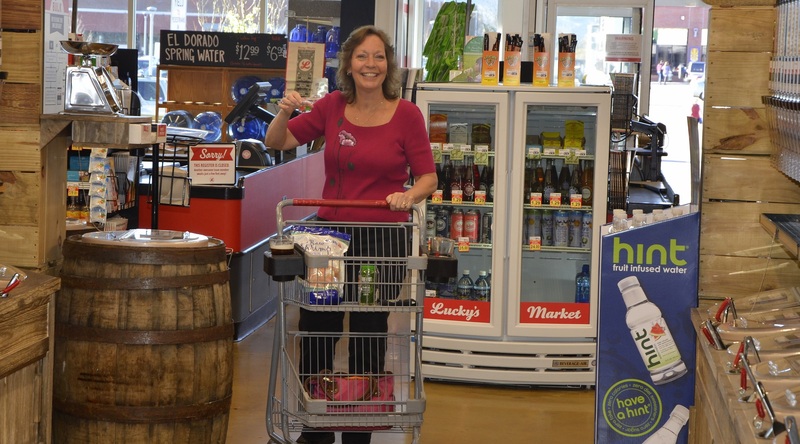 On April 6th, Lucky’s Market held a celebration in their South Boulder store, at 695 South Broadway. The celebration kicked off their “Sip and Stroll” program. Live music by the Monocle Band Duo, games on the front porch, and giveaways by Oskar Blues made for a fun time. And don’t forget the beer. Oskar Blues Beerito, a light and crisp Vienna-style lager was on tap. After talking with staff from Lucky’s and jotting down a few notes, I met my wife in the café, we grabbed a shopping cart, and two cup holders. Taylor, who was working the café, poured us two pints of beer. For two dollars each. Cheers. Time to shop. 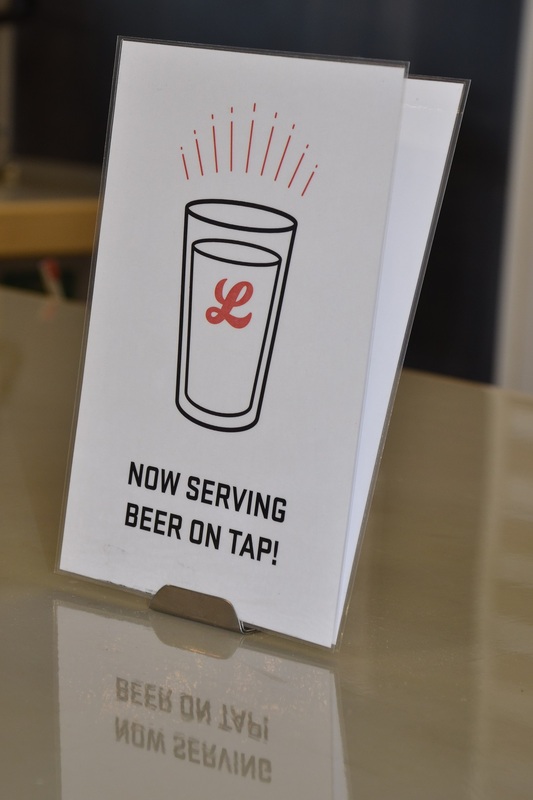 Lucky’s Market in South Boulder is the first store in the state to serve beer that shoppers can sip while strolling through the store. Last year, Governor Hickenlooper signed Senate Bill 197, which gradually allows grocery stores to sell beer other than 3.2 strength beer. Stores can apply for and on a limited basis, acquire licenses to sell full-strength beer, wine and liquor. Lucky’s Market was the first to apply for and receive that license. I met with Krista Torvik and Kristen Tetrick in the café. Krista is a spokesperson with Lucky’s, and showed me around the store, introduced me to Lucas, the sales rep from Oskar Blues, and also to Kristen, the Director of Marketing and Community Impact for Lucky’s Market. Krista also gave me samples of their nitro coffee – cold pressed espresso infused with nitrogen, and Kombucha – fermented, effervescent sweetened black or green tea drinks. Both are always available in the café, and both were quite good. 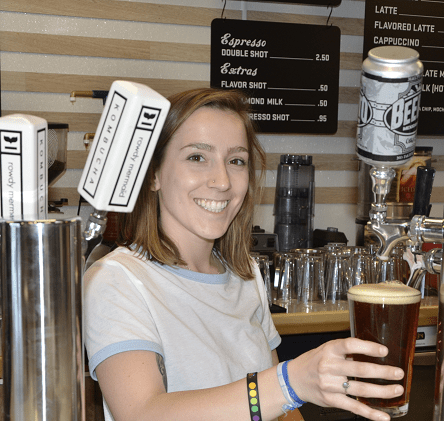 While enjoying the nitro coffee, Kristen told me about Lucky’s approach to the community. “We try to offer an experience for our customers. A fun experience.” she told me. Two Dollar Pints . . .
Lucky’s Market is more than a grocery store. Lucky’s sponsors several events and drives that benefit the community. For instance, with their Bags for Change program, customers receive wooden dimes each time they bring in reusable bags, and can donate the dimes to their choice of local non-profit organizations. On Impact Days, which occur each quarter, the store donates ten percent of sales for that day to a local non-profit. Lucky’s also donates ten percent of all sales of their store label products. Lucky’s Markets are in eleven states and there are twenty-four stores now open, with several more opening soon. Because of Colorado’s archaic liquor laws, which date back to prohibition, Colorado stores have not been able to sell beer with an Alcohol by Volume (ABV) higher than 3.2 percent. The South Boulder store is the first – not only for Lucky’s but for all stores in Colorado. Once my work was done, and my wife and I had our cart and our beers, we strolled through the store. First stop was at the Oskar Blues table, where Lucas had items for customers and information about Beerito and Oskar Blues’ connection with Lucky’s. We found out that Beerito will be the beer on tap at Lucky’s for the foreseeable future. This was good news to me. I really enjoyed the amber-colored, malty lager. Beerito is a light beer, with an ABV of around four percent. I found it to be a great sipping beer as we were strolling through the aisles, filling our cart. We were happy to see so many other shoppers, strolling through the aisles with beers in hand. We strolled past the hot food table, where customers could purchase freshly-prepared tacos. A hot bar will open in the store on May 1st. In about the time it took us to finish our beer, we filled our cart with fresh organic fruits and vegetables, eggs and milk, and a few canned foods, checked out, returned our empty glasses to the café, and were on our way home. Next time you are thirsty, need to get a few groceries, and are in South Boulder, check out Lucky’s Market. Grab a cart and cup holder, order a two dollar pint, and sip and stroll your way through the store. And make a toast to Colorado’s beer laws finally reaching the twenty-first century. What fun it is to shop and drink!